Traffic engineer Jamie Wilson is getting settled at the Street Department as St. Louis' first Bike/Pedestrian Coordinator. Mayor Francis Slay established Wilson’s position to improve pedestrian and bicycle transportation as part of his Complete Streets initiative. 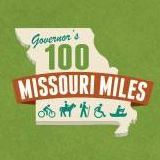 MoBikeFed comment: Advocates have long been urging St. Louis City to hire a dedicated bicycle/pedestrian coordinator to be the point person for bicycle and pedestrian planning, design, and construction across the city. Now that the city has finally made that move, expectations are high for the difference Wilson may be able to make.